INONGO, Democratic Republic of Congo, Apr 17 2018 (IPS) - Thousands of logs loaded into makeshift boats at the port of Inongo at Lake Mai-Ndombe stand ready to be transported to Kinshasa, the capital of the Democratic Republic of Congo (DRC). Inongo is the provincial capital of the Mai-Ndombe Province, a 13-million-hectare area located some 650 km northeast of Kinshasa. The logs have been illegally cut from the Mai-Ndombe forest, an area of 10 million hectares, which has some trees measuring between 35 and 45 meters. “We witness this kind of spectacle every day, whereby tons and tons of logs and timber find their way to the capital either via the Congo River or by road, where they will eventually be shipped overseas, or just sold to the black market,” environment activist Prosper Ngobila told IPS. Thousands of logs cut from trees 20 meters in height are currently lying in the Mai-Ndombe forest waiting to be hauled off, while thousands more have been left there to rot for years, Ngobila added. “It’s shocking to say the least,” he said. The forests of Mai-Ndombe (“black water” in Lingala) are rich in rare and precious woods (red wood, black wood, blue wood, tola, kambala, lifake, among others). It is also home to about 7,500 bonobos, an endangered primate and the closest cousin to humans of all species, sharing 98 percent of our genes, according to the WWF. The forests constitute a vital platform providing livelihoods for some 73,000 indigenous individuals, mostly Batwa (Pygmies), who live here alongside the province’s 1.8 million population, many of whom with no secure land rights. Recent studies also have revealed that the province – and indeed the forests – boasts significant reserves of diamond, oil, nickel, copper and coal, and vast quantities of uranium lying deep inside the Lake Mai-Ndombe. The WWF and many environmental experts, who deplore the gradual destruction and degradation of these forests for their precious wood and for the benefit of agriculture, continue to plead and lobby for their protection. The DRC has the world’s second largest rainforest, about 135 million hectares, which is a powerful bulwark against climate change. 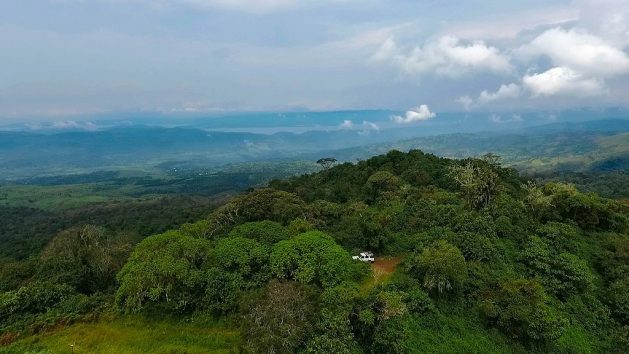 In an effort to save these precious forests, the World Bank in 2016 approved DRC’s REDD+ programmes aimed at reducing greenhouse gas emissions and fight forest’s deforestation and degradation, which it would fund to the tune of 90 million dollars annually. The projects, which are currently estimated at 20, have since transformed the Mai-Ndombe Province into a testing ground for international climate schemes. And as part of the projects, indigenous and other local people caring for the forests and depending on them for their livelihoods were supposed to be rewarded for their efforts. However, Marine Gauthier, a Paris-based expert who authored a report on the sorry state of the Mai-Ndombe forest, seems to have found serious flaws in these ambitious programmes. The report, released a few days before the International Day of Forests on March 21 by the Rights and Resources’ Initiative (RRI)), cited weak recognition of communities’ land rights, and recommended that key prerequisites should be addressed before any other REDD+ funds are invested. In the interim, it said, REDD+ investments should be put on hold. Gauthier, who has worked tirelessly behind the scenes to stop the funding from doing more damage to the people of the forest, told IPS in the aftermath of the report’s release, “In DRC and more specifically in the Mai-Ndombe, the history of natural resources management has always been done at the expense of local communities. Under the DRC’s 2014 Forest Code, indigenous people and local communities have the legal right to own forest covering an area of up to 50,000 hectares. Thirteen communities in the territories of Mushie and Bolobo in the Mai-Ndombe province have since asked for formal title of a total of 65,308 hectares of land, reports said, adding that only 300 hectares have been legally recognised for each community – a total of only 3,900 hectares. Alfred Mputu, a 56-year-old small scale forest farmer who is among the people still waiting for a formal title, told IPS: “I have been working and living in this land for decades, but as long as I don’t have a formal title that gives me the right to own it, I wouldn’t say it belongs to me. The consequences of these communities living in and around these forests with no secured land rights could be dire, according to experts. Zachary Donnenfeld, Institute for Security Studies (ISS) senior researcher for African futures and innovation, told IPS: “They could have their land sold out from under them by the government, likely to a private multinational company. Pretoria-based Donnenfeld added: “My guess is that the government is more interested in selling these resources to multinationals than it in seeing it benefit the community. Gauthier pointed out that these situations create poverty and conflicts between project implementers and communities, as well as between communities. “Instead, when communities get secured land rights and are empowered to manage their lands themselves, studies show that it is the best way to protect the forest and even more efficient than government-managed protected areas. Gauthier said if their land rights are not secured, they can get evicted, as has already happened elsewhere in the country, such as South Kivu in the Kahuzi Biega National Park where 6,000 pygmies were expelled. Many observers say situations such as these impact negatively on the most vulnerable – women and children – who are already bearing the brunt of a country torn apart by dictatorship, economic mismanagement, corruption and two decades of armed conflict. Chouchouna Losale, vice-coordinator of the Coalition of Women for the Environment and Sustainable Development in the DRC, told IPS that a humanitarian crisis has ensued in the Mai-Ndombe Province after the savannahs donated to women were ‘given’ to an industrial logging company. “There are now cases of malnutrition in the area,” Losale said. The Coalition of Women for the Environment and Sustainable Development advocates for the recognition of rights and competence of women in general, and aboriginal women in particular, in the Congolese provinces of Mai-Ndombe and Equateur. “I urge the government to advance the process of land reform in order to provide the country with a clear land policy protecting forest-dependent communities,” Losale said, adding that proper consultation with communities should be done to avoid conflict.